Amidst an audience of over 132 distinguished guest, several journalists and keynote speaker Mr Trevor Manuel, WWF-South Africa in partnership with Pick’n Pay launched an exciting and comprehensive report on the South African’s ocean economy: facts and futures at the Two Oceans Aquarium. The report, which collates the findings of relevant research from across multiple sectors, offers a snapshot of the state of South Africa’s oceans in 2016. It highlights both the socioeconomic value of the goods and services provided by the ocean and some of the key ecological trends and indicators. 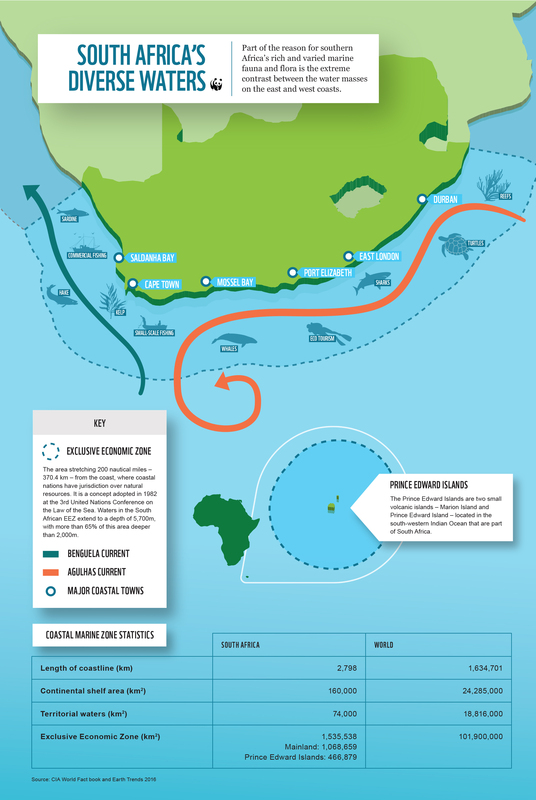 The report’s ocean scorecard highlights that many of South Africa’s marine resources are currently overexploited, which results in a loss of potential food protein, livelihoods and income, as well the loss of the traditional fishing culture associated with South Africa’s coastal communities. On the positive side, the report also showcases some of the best-practice solutions that WWF and others are implementing – such as the Southern African Sustainable Seafood Ini tiative (WWF-SASSI) campaign to encourage consumption of sustainably sourced seafood. As a result of consumer pressure, many of South Africa’s major retailers and seafood restaurant chains have set ambitious sustainability targets and, according to the report, are well on their way to meeting them. The report clears illustrates that marine ecosystems underpin human survival and development, from the air we breathe to the food we eat. In 2012 and 2014, the Department of Mineral Resources granted three prospecting rights for marine phosphate to private companies. These rights extend over a considerable portion of South Africa’s marine environment, together covering more than 150 000 km2, approximately 10% of our exclusive economic zone. Since prospecting rights are being granted there is every indication that marine mining will become a reality. The type of technology employed for seabed mining, Trailing Suction Hopper-Dredge (TSHD) has not been tested anywhere else in the world and is comparable to strip mining the sea floor at an alarming rate. This process creates a giant plume of toxic sediment that buries and smothers marine ecosystems. Of critical concern, the socio-economic impacts of seabed mining have not been assessed. Finally, our current legal and governance framework is inadequate for dealing with bulk marine sediment mining. In response to these concerns, a group of organisations formed a coalition. The Safeguard our Seabed main objective of the coalition is to pursue a moratorium, or ban, on bulk marine sediment mining in South Africa. Beneath the waters off the western coast of South Africa, an epic struggle for survival is ongoing by one of South Africa’s most iconic marine species, the West Coast Rock Lobster (Jasus lalandii). This species, prized for its flavourful meat and relative ease of catching, is the subject of rampant, illegal fishing that is threatening the species’ very survival and the fishers who depend on it. The team at WWF-SASSI is doing all it can to bring attention to the issue and work with stakeholders to turn the tide for the lobsters. WWF-SASSI released a draft red-listing for WCRL in 2016 because the resource is sitting precariously close to collapse. As one of South Africa’s oldest and most important commercial fisheries, the WCRL fishery provides direct employment to an estimated 4 100 people and has an annual turnover of around R530 million. But, with stock levels currently sitting at 2.5% of their historical size, largely as a result of overfishing and increasing levels of illegal harvesting, there has been growing concern from all sides that the resource is facing a complete collapse unless we can change its current trajectory. Against this backdrop, WWF South Africa (WWF-SA), the Department of Agriculture, Forestry and Fisheries (DAFF) and stakeholders have been collaborating on a Fisheries Conservation Project (FCP) for the WCRL fishery. The FCP aims to move the fishery back towards healthier stock levels and create the improvements needed to support a SASSI green listing in years to come. 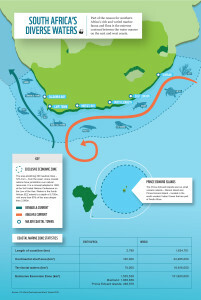 The International Coastal Clean Up was a huge success for South African coastlines. This event sponsored by Woolworths South Africa, took place around the country on Saturday 17 September 2016. Scholars and volunteers as young as six years old braved the cold morning in Cape Town and Durban and tackled the mammoth task of how ridding the beaches of litter. In Durban, Woolworths teamed up with uShaka Marine World. and hosted over twenty schools with an overall coastal clean up team of five hundred people. In Cape Town, SASSI, the MSC (Marine Stewardship Council) and Plastics SA and were given a platform at this event to speak on sustainable seafood, eco-labelling and other marine issues. A huge congratulations to everyone involved! With the current plight of dwindling fish populations and exploitation of fisheries both globally and nationally, WWF-SASSI aims to make its mark in the sustainable seafood hub in Gauteng. As South Africa’s economic gold mine, Gauteng’s seafood industry is fast growing and high demanding. Creating awareness on sustainable seafood is pivotal to making a marked change in how we as consumers, retailers and restaurants view seafood. Implementing SASSI friendly measures that ensure we make the green choice and question the source of our seafood is high on the agenda to develop a food conscious society. Some of Gauteng’s top chefs have already volunteered to be a SASSI ambassador and some new and exciting news is to follow. The newest member to the WWF-SASSI team is Master of Science Wits graduate, Melisha Nagiah (pictured above ). With a tenacious and passionate spirit, the Johannesburg based SASSI Programme Officer is motivated to bring about effected change in the consumer and retailer market ensuring we are all committed to creating and maintaining a sustainable seafood industry. Inspired by Mandela’s legacy and his commitment to social ju stice and human wellbeing, WWF South Africa’s employees rolled up their sleeves to work at various community projects across the country, contributing their 67 minutes to society to uphold Madiba’s legacy. In the southern peninsula of Cape Town, a team of committed WWF graduate interns from WWF’s co-ordinated a group activity for about 40 WWF staff at Kommetjie’s Masiphumelele informal settlement, the home of the Masakhane Educare Centre for early childhood development. WWF teamed up with the BGCMA, GIZ, Witzenberg Municipality and litter in the polluted Wabooms River for Mandela Day. From inland Ceres to coastal Kleinmond, residents of this fishing town have been pooling resources to clean up their coastline. Mandela Day was the town’s second demonstration of community spirit in 2016, following the Kleinmond Harbour Clean Up Day on 4 June which saw locals, equipped with garden tools and refuse bags, clearing litter around Kleinmond’s popular harbour. In Gauteng, a few of our pandas joined the Minister of Water and Sanitation on Jukskei river clean-up campaign in Alexandra. All of these Mandela Day activities are connected to WWF’s on-going work with communities which aligns with one of WWF-SA’s strategic goals to ensure that healthy ecosystems underpin social and economic well being.